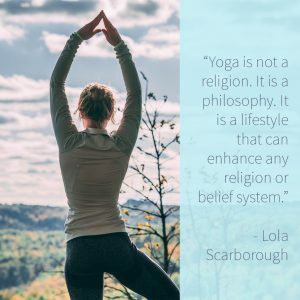 On Yoga and living to be 125 years old with Lola Scarborough Lola Scarborough a Yoga Studio owner and alternative health advocate. She recently published a book about avoiding breast cancer. She non-mainstream approach to health care and maintenance and advocate strong self-care practices. Lola Scarborough wants to live to be 125 years old. And why not? In this fascinating conversation we explore Yoga, nutrition, Eastern versus Western thought, and other topics. 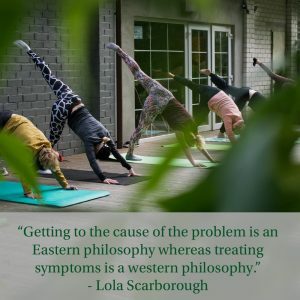 Lola Scarborough a Yoga Studio owner and alternative health advocate. She recently published a book about avoiding breast cancer. She non-mainstream approach to health care and maintenance and advocate strong self-care practices. Mimi’s Miracle Cell Fuel. Get 15% off when you use the podcast listener code INSIDER at check out. 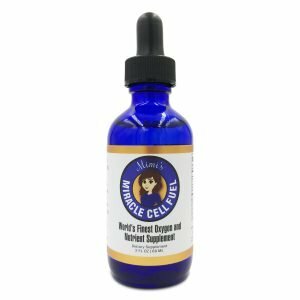 Learn about Mimi’s Miracle Cell Fuel here. To download this episode click here. Lola has a BA in Political Science, a two-year degree in Ayurveda, and is currently working on a Ph.D in Comparative Religion. she is a 500-hour certified yoga teacher, and has lead and taught more than 10,000 hours of classes in yoga, meditation, chanting, and sound healing. My goal is to live a health driven life for 125 years. Western pharmaceuticals often come with such serious side effects that you have to wonder if the cure isn’t worse than the ill.
Getting to the cause of the problem is an Eastern philosophy whereas treating symptoms is a western philosophy. Yoga is not a religion. It is a philosophy. It is a lifestyle that can enhance any religion or belief system. 20:00 It’s about good strong morals. It’s about loving. It’s about staying grounded. It’s about letting go of anger and resentment. It’s about conquering fear. 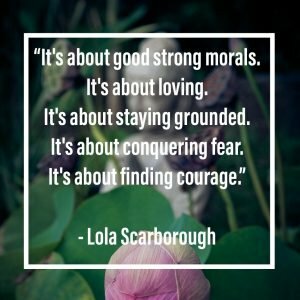 It’s about finding courage. It’s about standing up for those who can’t stand up for themselves. It’s about being a voice that is deeply connected to spirit, whatever you may call that in your belief system. They say 1 in 8 women will develop breast cancer in their lifetime. I say those odds are unacceptable. About 36: The more you get in touch with your feelings, and the better your diet is, and the better you take care of yourself, and wise use of supplements and vitamins, you greatly increase your chances of living a disease free life. 40 Favorite healthy breakfast: Smoothie.